Play different arcade games with The Lion King characters Timon and Pumbaa. Hippo Hop - Help Timon travel across the river while collecting the grubs for Pumbaa's grill. Be sure to avoid the hyenas! Jungle Pinball - A zany pinball games with hyenas, elephants, gophers and more! 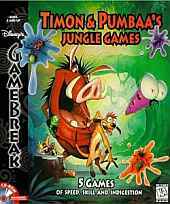 (similar version released later as Disney's Hot Shots: Timon and Pumbaa's Jungle Pinball). Sling Shooter - Shoot berries at various targets popping up. (similar version released later as Disney's Hot Shots: Swampberry Sling). Bug Drop - A Tetris-like game. Play against the computer or a friend. Burper - Collect grubs while avoiding/destroying unwanted ones with Pumbaa's powerful burps. The main menu has many hidden animations that can be found when you click on various objects.